Dry erase memo board for quick notes and reminders. Fellowes Office Suites Desktop Copyholder, Plastic, 150 Sheet Capacity, Black/Silver - Desktop Copyholder places documents at eye-level to help prevent neck strain and improve your efficiency. Design functions as a document holder, memo board and clipboard, adjusts easily for A4/letter/legal paper. Holds up to 150 sheets at a time. Adjustable tilt customizes your viewing angle by up to 45 degrees. Movable line guide slides up or down and swings out of the way when not in use. Dry-erase memo board is ideal for quick reference notes or reminders. 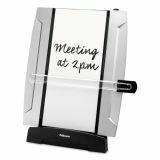 Slide out and turn over copyholder backing to use the memo board feature. 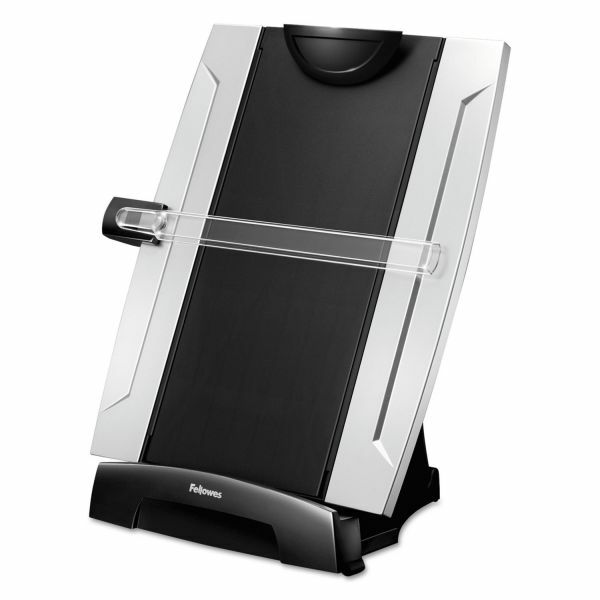 Desktop copyholder with erasable memo board matches the rest of Fellowes Office Suite Desk Accessories with smart styling in contemporary black and silver for the professional work space.